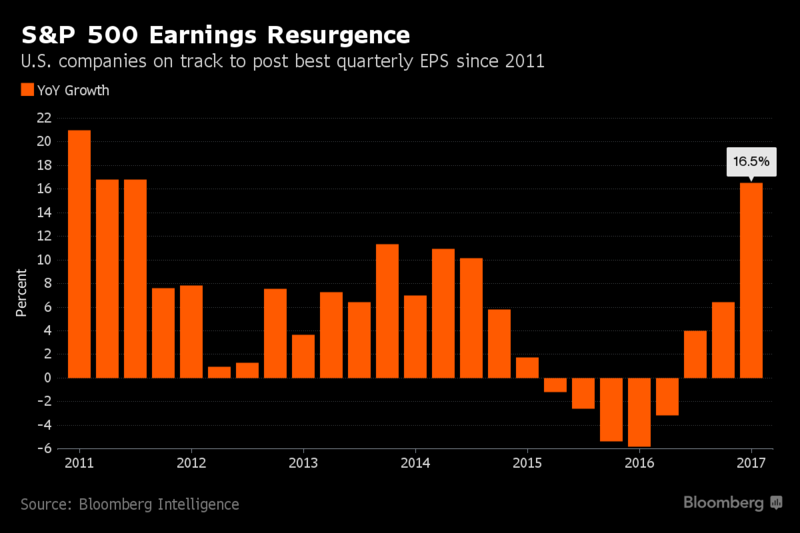 The S&P 500 just posted its highest earnings growth in six years. That means the stock market should be surging, right? Instead, what we have is a fearful market that isn’t sure how to process what’s going on. The reason behind this is simple. Smart investors don’t buy stocks because of what’s going on right now, or what’s gone on in the past. Smart investors buy stocks when they see a bright future. Back in the spring of 2016, the market had just gone through a very quick correction that resulted in the worst opening week to a year in history. Everyone was saying that 2016 would be the next 2008. And then in mid-March, the earnings numbers came out for the end of 2015. It wasn’t pretty. Earnings were down over 15% from the previous year. And what did the market do? In just a month and a half, from the start of March to mid-April, it rallied about 15%. That’s what the market gains, on average, over two years. It does seem strange that the market rallied on bad earnings. But remember, smart investors look forward. They don’t worry about the present. Smart investors knew this turnaround was coming, so they bought into it. So what the current state of the market really means is that people are not sure about what lies ahead in terms of growth. Going from over a year of subzero growth to 16% within a few months is frightening to smart investors. Who knows if this growth will continue? The smart mindset is to pull out money, and wait and see.